Martyn Hilbert's Railway Photography - Last additions - Barclay Fireless 'Lord Ashfield' at Kearsley Power Station. Barclay Fireless 'Lord Ashfield' at Kearsley Power Station. On the evening of May 13th 1982, redundant CEGB North West Area locomotives were in secure storage at the mothballed Kearsley power station between Bolton & Manchester. 'Lord Ashfield' had come from the closed Fleetwood power station. 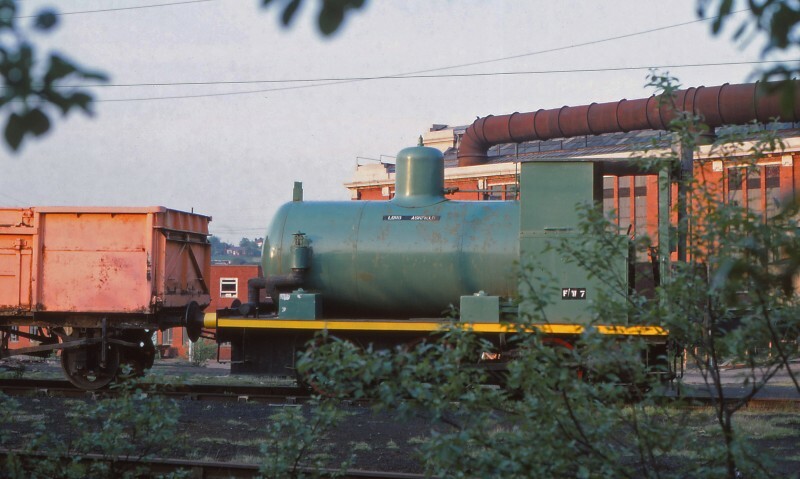 The fireless locomotive was built by Andrew Barclay of Kilmarnock in 1931, (Works Number 1989) and went new to Brimsdown power station in East London. It was transferred to Fleetwood in 1975. It is now preserved in the SRPS museum at Bo'ness.